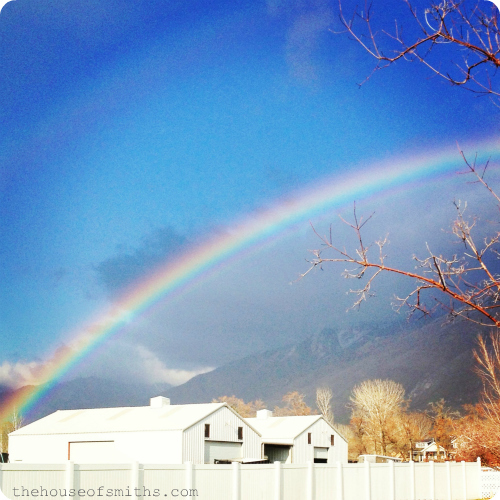 If you could have the perfect weather... what would it be? Mine is sunny, with white puffy clouds, 70 degrees and a slight warm breeze. Well guess what? We've had an entire WEEK of weather like that here, and have been soaking up every minute of it. 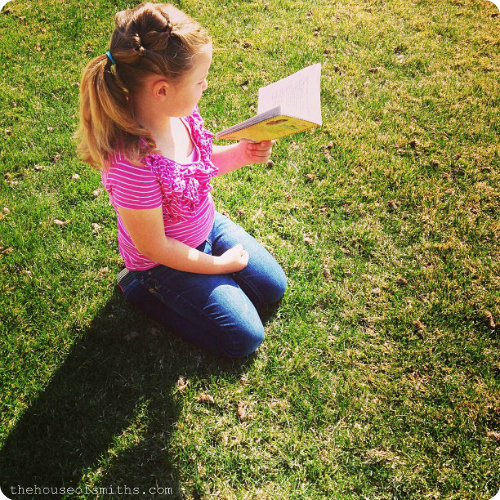 I found Emberly on the front lawn yesterday morning, reading a book out loud and bathing in the sunshine. It made me smile. I love when my kiddos spend lots of time outside. Like I mentioned in our post this past Monday, our cousins are all in town for Spring break, so we decided, since it was so nice, to take in a little hiking while they were here. Honestly, it's still a bit wet and muddy; not ideal hiking conditions YET... but it was so nice to just be outside again, letting the kids run around and spend some time together. Spring is by far my most favorite time of the year, but the only problem is... it comes and goes so quickly! Don't get me wrong, one of the best things about living in Utah is having a good dose of all 4 seasons to experience each year, but this usually means that the ones you REALLY love (like Spring and Fall) tend to fly by a lot faster. Right before and during the first part of Spring is the BEST time to get your yard ready for the warm Summer months... right? Well ya know what? I don't WANT to spend time working on my yard when it's beautiful outside and I could be picnic-ing or hiking with my family! It would be different if we had a small little yard to keep up, but that's not the case. Our yard is HUGE, and we have to spend a good part (if not most) of our Saturdays whipping things back into shape after just one week of growth. When we built our home on this lot 6 years ago, we thought we were super slick for getting all this awesome land and covering it with nice, green grass. NEWSFLASH: The bigger your yard, the more TIME you have to spend keeping it up! ok, ok, this isn't really a conversation we've had, but yet I feel that there is some truth behind this cartoon, when it comes to Cason's silent, comforting, calming ways... and the topic of the yard. ... it wasn't until I saw this picture 2 years ago, that I knew enough was enough. Gasp, roll your eyes and judge all you want, but after 5+ years of forgetting to fertilize or aerate at the "right time" and killing our lawn over and over again... this year, we finally just threw our hands up in the air and hired the whole thing out to the pro's at Scenic View Landscape. We initially wanted to have them come and just look at, and potentially fix our sprinkler system because it's been totally out of whack, but then we ended up having them do all of our maintenance as well, to get ready for the warmer weather. They applied a fertilizer a day or so before the rain came and then after a good Spring clean-up, mowed, aerated and fertilized again. Our lawn already looks SO MUCH better! While I knew Scenic View was really good at maintenance, once I started talking about my "back yard dreams"... that's when I saw their eyes really light up. After throwing a few ideas around, LeRoy, the owner, for over 25 years, came up with a quick, rough sketch of what he thought would look really great in our backyard space. It's a bit confusing to look at, without knowing all the detailed plans, and in no way can we actually afford everything we want to do, right NOW, but you've got to start somewhere, right?... and this is SUCH a great jumping off point for us! We felt so grateful to have this awesome "Scenic View" insight! For those of you who are local and want/need help or suggestions with your yard this Spring and Summer, I highly recommend Scenic View Landscape. The team is efficient, honest, friendly and has been around for almost as long as I am old. ha! Another bonus, is that they're offering a few specials this year too! For the month of April, they're giving 15% off all sprinkler system start ups and sprinkler repairs to new customers, and a free spring cleanup for anyone who signs a maintenance contract for this year. 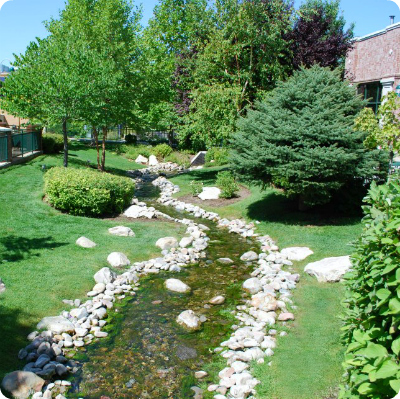 You can visit the Scenic View Landscape website to check out their beautiful work on past projects, and to contact them personally for bids on anything from a grand water feature to a full sprinkler system or even a simple lawn aeration, just get a hold of Brandon at (801) 577-3393. Now, I know the majority of you who read our blog aren't in Utah, and also a lot of you don't mind doing yard work on your own... and actually probably enjoy it (ya weirdos... jk) so I still wanted you to walk away with some great DIY tips about lawn care that the crew from Scenic View Landscaping was nice enough to share with me, to tell all of you! There are three main things that you'll need to do to get your lawn ready before spring and summer get here. If you can have these steps done properly, it will help your lawn to be thick and green in the coming summer months. Aeration: Get your lawn aerated. When you pull those little dirt plugs out of your lawn it allows for better water absorption, nutrient absorption and helps in the process of eliminating thatch; layers of living and dead stems, leaves and roots which accumulate between the layer of actively-growing grass and the soil underneath. Fertilization: We recommend at least four applications of fertilizer a year. Spring, early Summer, Summer, and Fall. You can have someone like Scenic View Landscape do it for you, or places like your local home improvement store or IFA have fertilizer programs you can follow to do it yourself. Irrigation: This is one of the most important things for having a healthy lawn. Too much or too little water can cause many problems for your lawn. Sometimes problems are as simple as having the wrong type of sprinkler heads or a clogged nozzle. The best way to make sure your system is working well, is to assess it yourself, or even better, have a professional come and start your system up for you to check to make sure everything is working well. They'll be able to quickly diagnose any problems for you, so they can be fixed, or you can fix them on your own. 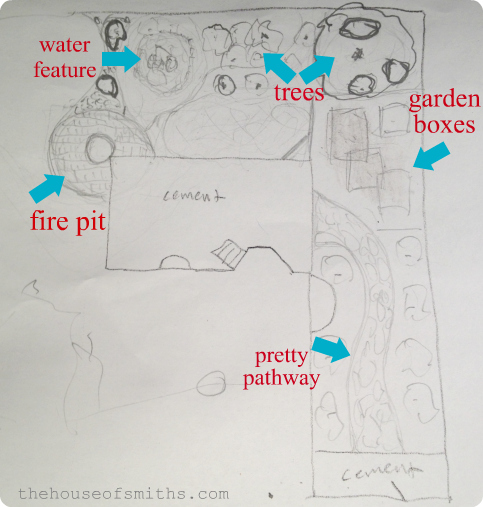 We are super excited to hopefully have a greener, healthier lawn this year and maybe even implement a few of these cool, sketched ideas into our yard as well. We will definitely keep you updated with any developments that happen along the way! My husband and I are terrible at doing yard work. We finally hired someone to maintain our yard and it's been awesome. I did plant a few flowers this spring and my fingers are crossed they will survive my black thumb. Avid reader, but rarely comment. I visit your blog for inspiration, but am NOT creative whatsoever!! I just chuckled about your lawn redo. We've just over 3 acres. We bought it 12 years ago for our rough, wild boys to run around. Now our girls are enjoying it, but it is way too much to keep up with. Yes, it is nice to have...but not so nice to keep up. Three+ hours of mowing?! Crazy!! I've been thinking of cutting back some area with some landscaping, but in the country, we deal with constant weeds. I should own stock in weed killer! Too much lawn is too much work-we got rid of 2/3 of our front when we redid our place; our back is terraced so we planted wildflowers on one level and did bark chips in the places we didn't want to have to maintain via mowing. This is my field of expertise and I must say I agree with most of their tips although you only need to aerate your lawn if your thatch is over 1/2" thick. Thatch of 1/2" or less is fine. BTW, during the growing season your lawn (on average) only needs 1" of water per week. Looking good! Bring on Spring! You're going to love having the professionals take care of your weekly chores. It's so worth it. Before I sold my house, I spent $$$ to have it landscaped. It turned out so much better than I ever dreamed and I felt like I was on vacation at a high end resort just by walking outside! 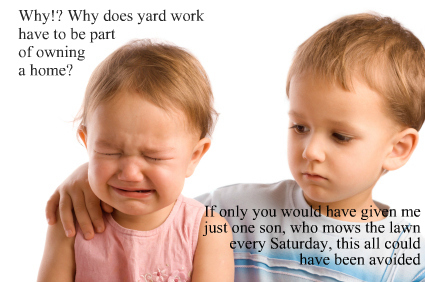 It really does make you spend a lot more time outside enjoying your yard. OOooohhh, that is going to be a marvelous yard! And you will probably start fixing it up very soon because it will be so much fun to be outside working on it together. Thank you for the timely post. we have been slowly but surly trying to get the lawn at our new house to look less like it belongs to a crack house. *sigh* I'm very tempted to just hire someone but with all the other things still needing to be done, i cant justify the cash yet. Hope your lawn looks lovely this summer! I loved this post. Your idea of perfect weather is mine exactly. 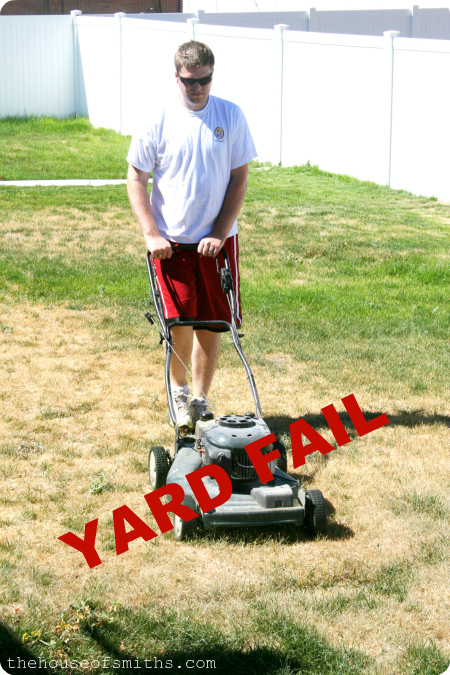 And, I can totally relate to your "Yard Fail." Thanks again for the inspiration [and the link for Scenic View!] I'm thinking I may be calling them! I like their ideas- I especially like that it results in a more waterwise landscape. You know you can always come by the Garden where I work with the Fam and check out more than 800 plants (all labeled) so you'll be able to tell Scenic View exactly what you like! You need more rooms to decorate, may as well try a few outdoor versions! Ha ha. I'm the exact opposite. Maybe we should do a house swap for a while. We have five acres that was all weeds when we moved in. I spend every hour of semi-decent weather outside and the yard has improved leaps and bounds, but the house is mostly still the same as when we moved in. No, really, I WIN the award at being bad at lawn care!! I have a 3 acre property with a fence all the way around and a gate out front and I keep a pony on the back 1/2 acre. Everyday after the mailman comes, the front gate gets locked and the pony comes out to mow till morning. :-D I only ran the mower over it twice last year just to get some stray weeds that didn't suit her palette.